Join a group machine embroidery enthusiasts and work on your projects. This group meets on the 4th Thursday of each month. Machine embroidery experience is required. You must have your designs saved to a USB stick in the format and embroidery hoop sizes used by your machine. 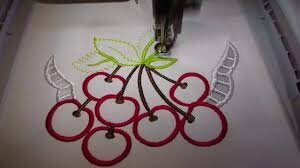 Your machine must be in good working order Supplies: bring the machine cord, embroidery hoops, stabilizer, designs on usb stick, and all other supplies necessary to stitch out your design.